Simply put, cats need to consume meat to be healthy, to thrive, and to survive. They are obligate carnivores. Cats cannot survive on a plant-based diet. 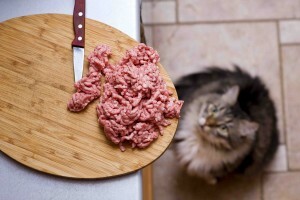 Anything other than animal protein will not provide the necessary nutrients for cats to live on. They can only find those nutrients in animal protein, from animal muscle tissue and organ meats. Unlike us and other omnivores, cats do not have the necessary digestive enzymes to process plant-based foodstuffs, such as starches, carbohydrates, and even plant-based proteins. Cats in the wild do consume a small amount of plant nutrients, but it’s usually incidental (i.e. plants in the stomach of an herbivore prey). That amount is all they need from the plant world. The rest must come from animal, bird, and fish proteins. 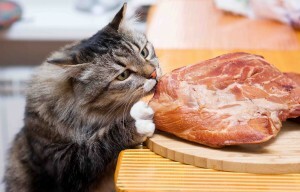 So, why are cats obligate carnivores? How did they develop this way? Well, no one really knows how or why some animals developed to eat other animals and some animals developed to eat plants. Many things in biology are happy accidents. For whatever reason, some animals were optimized for meat consumption, and their bodies are evidence of this. Most obligate carnivores can’t make amino acids and other essential vitamins in their bodies. Therefore, they need to get these nutrients from animals that already do have them. Herbivores and many omnivores can generate these nutrients from plant-based sources. Obligate carnivores eat these animals and take in those nutrients. Why reinvent the wheel when you can just take it. It seems very unfair, and it is because life itself is inherently unfair, but that’s how nature is and we can’t change it. 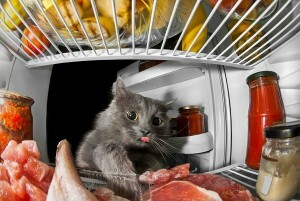 Another interesting fact is that cats also get most of their hydration needs through meat. Again, in the wild, cats of all species get their water intake through their prey. Blood has a high water content, and what is meat but a densely-packed collection of sacs filled with blood? So when carnivores (and omnivores) eat meat, they’re actually consuming blood. You may never look at a steak or chicken breast the same way again. In essence, meat eaters (including humans) are vampires. Now, there’s food for thought (sorry again for the terrible pun). Then is it possible to put your cat on a vegan diet and supplement this with protein powder? This is a tricky question because there are those who say yes and those who say no. However, we can say that the more natural the option the better. This is because any meat or fish protein will naturally have the nutrients that cats need to thrive. Only animal proteins have complete amino acids, plant-based proteins do not. We humans (and omnivores, such as dogs) can synthesize complete amino acids and other nutrients through the various foods we eat, even if it’s completely vegetarian. However, cats cannot do this. That is why cats are obligate carnivores – they must get their essential nutrients in its whole form from the meats they consume. In short, cats need meat. This isn’t about a lifestyle choice, it’s about what cats need in order to live a healthy life. The cat family did not choose to be obligate carnivores for any sort of social or political reasons. They have simply evolved that way through the biological conditions that they were faced with over the eons. Cat don’t eat meat because they dislike other animals. Rather, cats eat meat because that’s how their bodies and physiologies developed over millions of years. Cats are obligate carnivores. They have to eat meat. This is something we need to recognize so that our furry feline friends will be as healthy and happy as nature intended.